mmsonline.com November 2017 MMS 77 FEATURE Bridge components must be cut from particular por- tions of the square brass workpieces depending on the particulars of the movement design and the width and spacing of Geneva stripes like the ones visible here. prefers to deburr by hand in some cases, but many parts are too small and fragile. Mr. Hughson says he spends a lot of time strategizing about how to leave a clean surface or to ensure burrs form in a manner that doesn't disrupt the hand- work. For instance, a cer tain feature might be machined from the opposite side of the part than initially intended, or a profile cut might not fully penetrate the part in order to prevent a burr from pushing through to the other side. 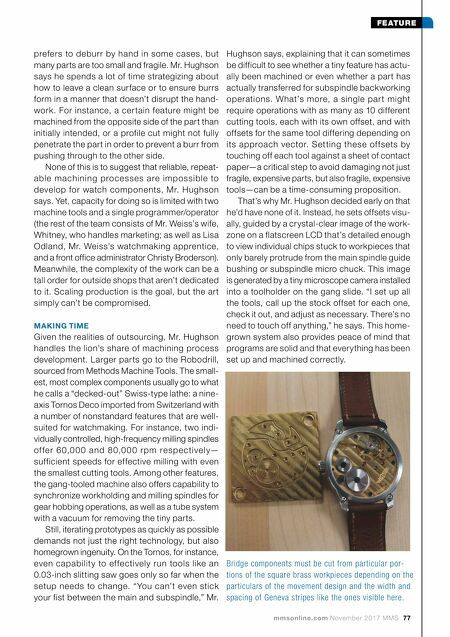 None of this is to suggest that reliable, repeat- able machining processes are impossible to develop for watch components, Mr. Hughson says. Yet, capacity for doing so is limited with two machine tools and a single programmer/operator (the rest of the team consists of Mr. Weiss's wife, Whitney, who handles marketing; as well as Lisa Odland, Mr. Weiss's watchmaking apprentice, and a front office administrator Christy Broderson). Meanwhile, the complexity of the work can be a tall order for outside shops that aren't dedicated to it. Scaling production is the goal, but the art simply can't be compromised. MAKING TIME Given the realities of outsourcing, Mr. Hughson handles the lion's share of machining process development. Larger parts go to the Robodrill, sourced from Methods Machine Tools. The small- est, most complex components usually go to what he calls a "decked-out" Swiss-type lathe: a nine- axis Tornos Deco imported from Switzerland with a number of nonstandard features that are well- suited for watchmaking. For instance, two indi- vidually controlled, high-frequency milling spindles of fer 60,0 0 0 and 80,0 0 0 rpm re spe ctively— sufficient speeds for effective milling with even the smallest cutting tools. Among other features, the gang-tooled machine also offers capability to synchronize workholding and milling spindles for gear hobbing operations, as well as a tube system with a vacuum for removing the tiny parts. Still, iterating prototypes as quickly as possible demands not just the right technology, but also homegrown ingenuity. On the Tornos, for instance, even capability to ef fectively run tools like an 0.03-inch slitting saw goes only so far when the setup needs to change. 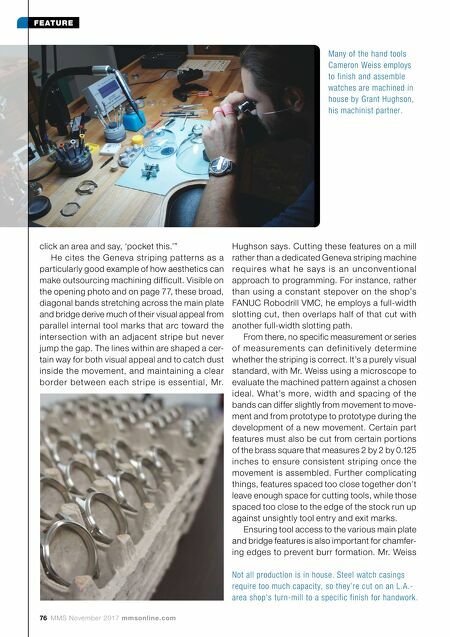 "You can't even stick your fist between the main and subspindle," Mr. Hughson says, explaining that it can sometimes be difficult to see whether a tiny feature has actu- ally been machined or even whether a part has actually transferred for subspindle backworking operations. What's more, a single par t might require operations with as many as 10 different cutting tools, each with its own offset, and with offsets for the same tool differing depending on its approach vector. Setting these of fsets by touching off each tool against a sheet of contact paper—a critical step to avoid damaging not just fragile, expensive parts, but also fragile, expensive tools—can be a time-consuming proposition. That's why Mr. Hughson decided early on that he'd have none of it. Instead, he sets offsets visu- ally, guided by a crystal-clear image of the work- zone on a flatscreen LCD that's detailed enough to view individual chips stuck to workpieces that only barely protrude from the main spindle guide bushing or subspindle micro chuck. This image is generated by a tiny microscope camera installed into a toolholder on the gang slide. "I set up all the tools, call up the stock offset for each one, check it out, and adjust as necessary. There's no need to touch off anything," he says. This home- grown system also provides peace of mind that programs are solid and that everything has been set up and machined correctly.